In 2000, Congress legislated that, upon request of the next of kin, all eligible veterans must receive military funeral honors when they pass on. At a minimum, the funeral honors will consist of a two-person uniformed military detail, with at least one member representing the service branch of the deceased. The legislation also encourages veterans service organizations, including the American Legion, to augment the honors detail as an authorized provider with pallbearers, firing party, bugler and color guard. The American Legion has performed tens of thousands of burial ceremonies for veterans’ families throughout its history; this will not change. As a result, the Legion has adopted certain ways and means that may differ from other groups. This does not mean they are wrong or improper ---- just different. It is the sacred obligation of all Americans to honor our deceased veterans by performing these time-honored duties in the best tradition of the deceased veteran’s service. The American Legion helps fulfill that obligation by supplementing the effort of the military service. information. Membership in the American Legion is not required. At the front door of the Bandera American Legion Post --- before monthly meetings, at community and holiday events, and memorials, we call attention to Americans still unaccounted for from WWII, the Korean War, the Vietnam War and other conflicts. This physical symbol of POW/MIA's and the cause for which we stand -- their return or full accounting. A detailed explanation is provided below. 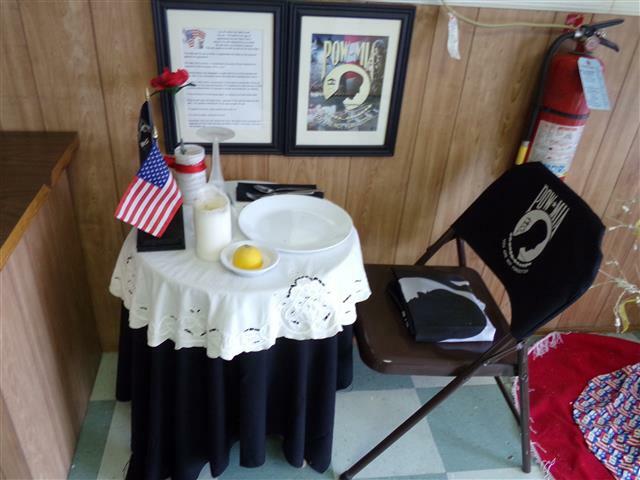 You may notice this small table as you enter the Bandera American Legion --- in a place of honor. It is set for one. Those who have served and those currently serving the uniformed services of the United States are ever mindful that the price of enduring peace and freedom comes at the highest prices of personal sacrifice. This table symbolizes our fallen and missing comrades. They are commonly called P.O.W. 's or M.I.A. 's, we call them brothers and sisters. The single red rose signifies the blood many have shed in sacrifice to ensure the freedom of the United States of America. The yellow ribbon represents all those who demand a proper accounting of our missing comrades. The candle is the light of hope that lives in our hearts to illuminate their way home, away from their captors, to the open arms of a grateful nation. You are not forgotten as long as there is one left in whom your memory remains!